Ceramic ball Christmas ornament in bold color and hand-painted design. Artisan font script, Bless this home with door and Christmas tree design. 4" diameter with curly wire hook for hanging and finished with tied striped ribbon and glass bead accents. Boxed. 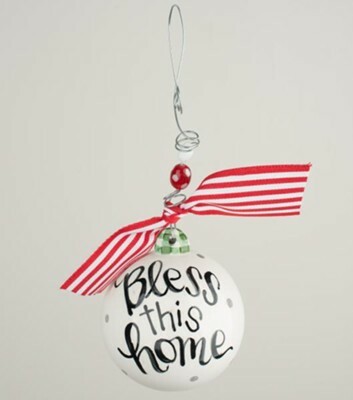 I'm the author/artist and I want to review Bless This Home, Ball Ornament.